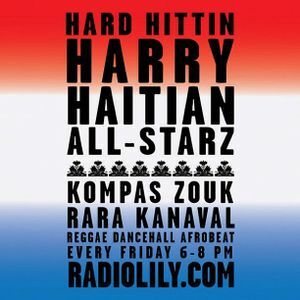 HAITIAN ALL-STARZ on www.radiolily.com. The show airs every Friday LIVE 6:00pm- 8:00pm from Miss Lily&apos;s Variety 130-132 West Houston (at the corner of Sullivan) in the West Village. The show is hosted by Hard Hittin Harry, DJ JayCee, DJ One, and Nit Ra Sit and features Kompas, Ra Ra Kanaval, Zouk, Reggae, Dancehall, Afrobeat and much more. We discuss all things Haitian infused with American and World Pop culture, politics, entertainment, and current events.